With its abundance of shoreline parks and inland green spaces that are often filled with feathered wildlife, Richmond is the perfect spot for some birding. But unlike many regions, winter is one of the best times to pull on your boots here and head outside for some avian encounters. We touched base with dedicated Richmond birder Kate Paton for her insights on the city’s cool-season birding scene. A self-described “very keen amateur naturalist and photographer,” Kate bird-spots almost daily here, posting evocative images of her finds via social media. Winter, she says, is her favourite birding season in the city. Tourism Richmond (TR): What makes winter a good time for birding here? Kate Paton (KP): When I first moved here, I wasn’t expecting to see much wildlife in winter. But to my amazement, the opposite is true: many birds visit from much colder places to enjoy our mild winter climate. And most aren’t breeding at this time of year, so you can just watch them feeding and flying and coexisting with all the other birds and wildlife. It takes your breath away! TR: So winter offers lots of birds we wouldn’t normally see? KP: Yes. We are directly on the Pacific Flyway, an invisible highway that migratory birds use to navigate up and down North America’s west coast. Since Richmond is on the coast and at the delta mouth of the Fraser River—with both dense marshland and sandy and grassy riverbanks that are great food sources—this is a safe resting place for these travelling birds. TR: What birds might people see here at this time of year? KP: Right now, the most noticeable are the enormous flocks of snow geese that have started arriving on their winter migration. 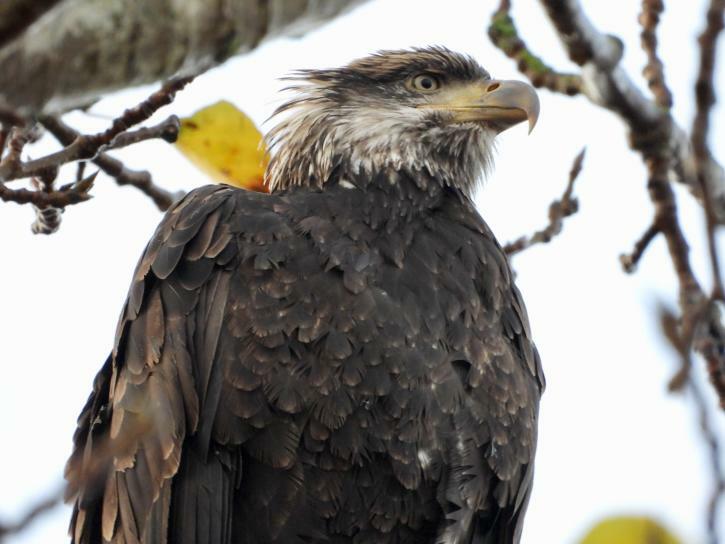 There are also raptors: many bald eagles winter here and breed in the spring. Nest-building and repairs have already started at some eagle sites I’ve seen. You can also spot red-tailed hawks, northern harriers, Cooper’s hawks, and many other raptors here at this time of year. But one of the most spectacular winter sights are the huge, swarm-like murmurations of shore birds­­—dunlins, dowitchers, sandpipers, sanderlings—that fill the sky with their dances. It’s incredible to watch. And if you visit shorelines and beaches, you’ll also see many types of ducks and other shore birds: a good bird book helps to ID them all! TR: What are some of the best places for winter birding in Richmond? KP: There are so many and you don’t need to travel far. For a longer walk, I’d go with Iona Beach Regional Park. It has beaches and marsh for the snow geese, sandpipers, and beautiful ducks such as Eurasian wigeons and green winged teals. There are also ponds and hedgerows for smaller birds, and tall cottonwoods for woodpeckers and raptors—including owls. There’s also excellent birding all along the West Dyke Trail from Steveston to Terra Nova. And the Richmond Nature Park never disappoints. It’s full of smaller birds like treecreepers, downy woodpeckers, and the Anna’s hummingbirds that winter here—if you’re lucky, you might also see owls and hawks. And don’t forget Minoru Park in the city centre. It has big grassy sports fields for the snow geese to congregate, as well as gardens, and hedges full of birds. There’s also a pond there that’s popular with ducks such as the uncommonly beautiful common merganser. TR: Are there any unusual or rare birds to look out for? KP: Richmond often gets rare bird sightings. I’ll never forget seeing the beautiful American avocet, an exquisite little shore wading bird that only visits briefly. And I’m hoping to see snow buntings this winter: I missed out last year. Recently a rare northern goshawk was also sighted in Richmond but I haven’t been lucky enough to see it yet. And last year, I spotted several short-eared owls: I usually have to visit Boundary Bay for those. TR: Do you have any tips for those keen to try winter birding in Richmond? KP: In winter, any time of day is good for birding here. I generally prefer the early morning but it can be very cold so be prepared—waterproof winter coat, gloves, hat, and boots are a must. And remember to be an ethical birder by respecting the wildlife at all times and keeping your distance: it’s never acceptable to bait or chase an owl in the marsh for that perfect shot. And don’t worry too much about choosing the best time or place to go in winter: there are so many birds here right now you’ll never leave disappointed!